The Empire State Paper Research Institute (ESPRI) is a leading international research organization in the pulp and paper industry. Established at ESF in 1960, this renowned organization is supported jointly by SUNY-ESF and the Empire State Paper Research Associates, a consortium of leading pulp and paper companies throughout the world. A model of industry and academic synergy, ESPRI investigates fundamental aspects of pulping, papermaking, and paper physics, including chlorine-free bleaching, properties of papermaking materials, paper structural characteristics, and printability. Empire State Paper Research Associates Inc. The Empire State Paper Research Associates Inc. is a non-profit corporation created to foster fundamental, precompetitive research for the benefit of its member companies and other constituents. The association provides funding for ESPRI and helps steer research projects and communications between the faculty, staff and students of ESPRI and ESPRA members. It is one of the very few associations with international membership and scope fostered toward application of academic research in the forest products industry. 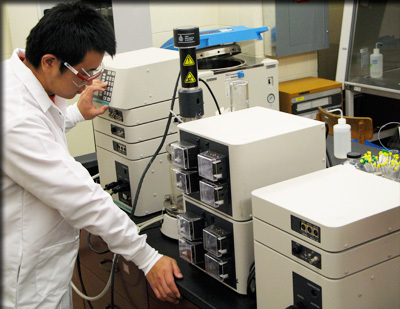 ESPRA partners with SUNY-ESF to jointly fund the research activities of ESPRI within the Department of Paper and Bioprocess Engineering (PBE). ESPRI is located in Walters Hall, the home of the PBE faculty on the SUNY-ESF campus. This building houses a modern pilot plant including two paper machines (PM1 & PM2 48" and 12" trim widths), pressurized 12" disk refiner, batch digesters, well-equipped pulping, bleaching, papermaking and paper testing laboratories. An environmental engineering laboratory and a complete deinking pilot facility are also available. ESPRI has a worldwide reputation for leading advances in pulping chemistry and lignins, bleaching including non-chlorine based bleach processes, water drainage and fines retention, physics of paper consolidation, moisture effects and diffusion, physics of paper materials, fiber mechanics, paper formation and surface properties. Recently, ESPRI has pioneered the concept of the biorefinery and development of new forest-based materials to provide value prior to pulping of wood.